MIT: NoMa Development Site 1 — Landworks Studio, Inc.
• east/west on Broadway with important new retail that including an urban grocer. 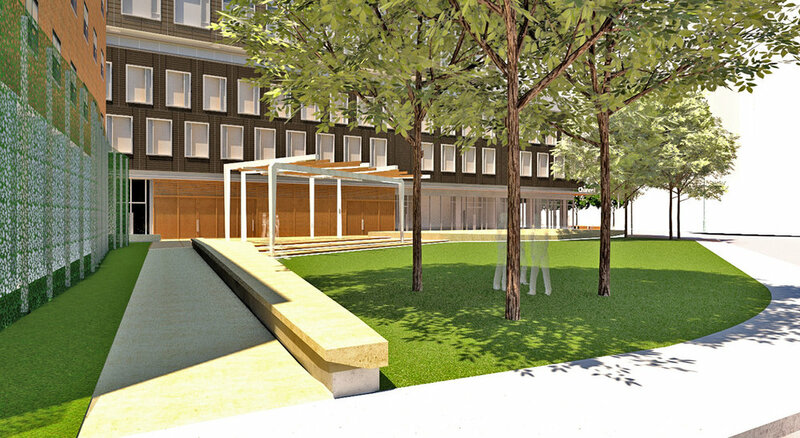 The open space consists of public streetscapes, a Pocket Park and the Pedestrian Corridor. Collectively these areas will serve to make all facades of the building active and integrated with the surrounding neighborhood. 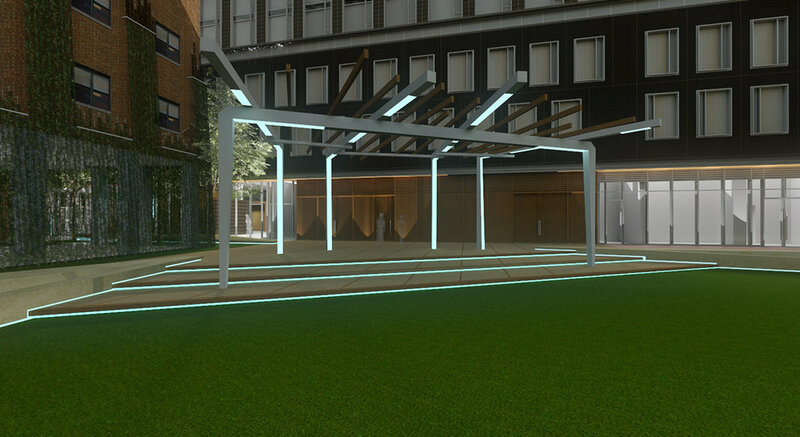 The design of the public realm is a collective attempt in both architecture and landscape architecture to produce seamlessness between first floor interior and exterior open space. The open space facilities are designed to enhance and expand existing facilities, as well as, to expand networks of pedestrian and bicycle movement within the vicinity of the development. 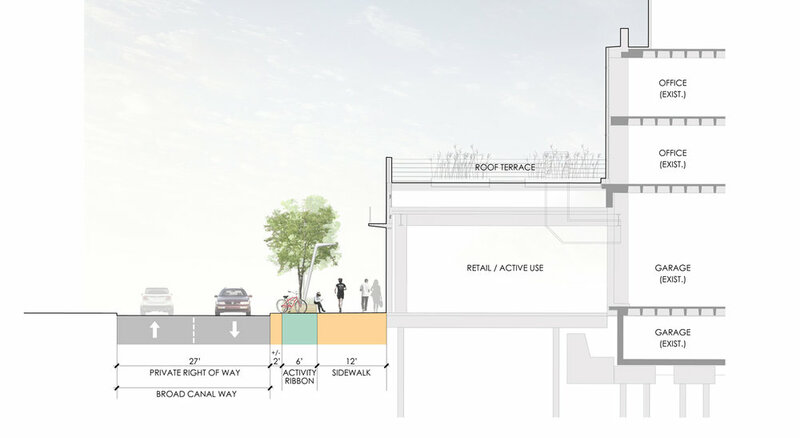 Pedestrian and bicycle amenities shall be extended throughout the Site as will lighting, provided for safety yet being cognizant of the surrounding building use and “night sky” objectives. 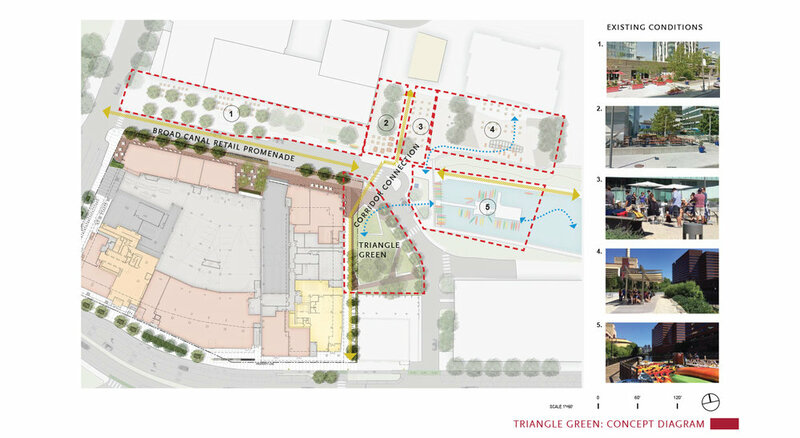 The Pedestrian Corridor, sandwiched between the new architecture, the existing Red Cross building, and Triangle Green, provides an active north-south connection to Broad Canal (with its very popular kayak rental) and beyond. 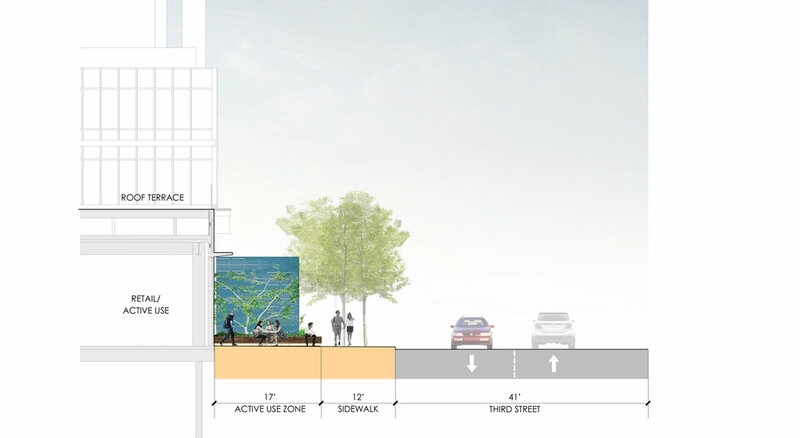 This passage will provide connectivity to and from MIT and East Cambridge designed with a dual purpose and scale of expedited circulation and enhanced retail experiences. Multiple unique opportunities to gather allow many users to congregate for dining, seating, and public interaction along Broad Canal Way and at the Pocket Park. 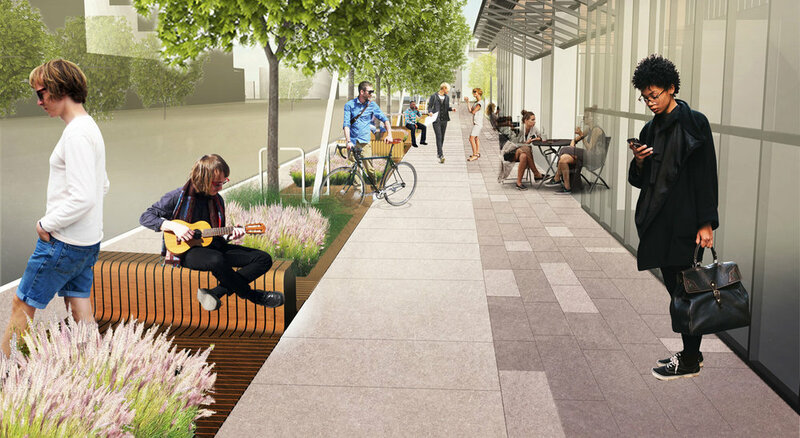 An intricate system of paving, seating, bicycle parking, lighting and planting, strengthens the pedestrian Broad Canal Way streetscape and flexible sidewalk seating and produces a vibrant urban realm. 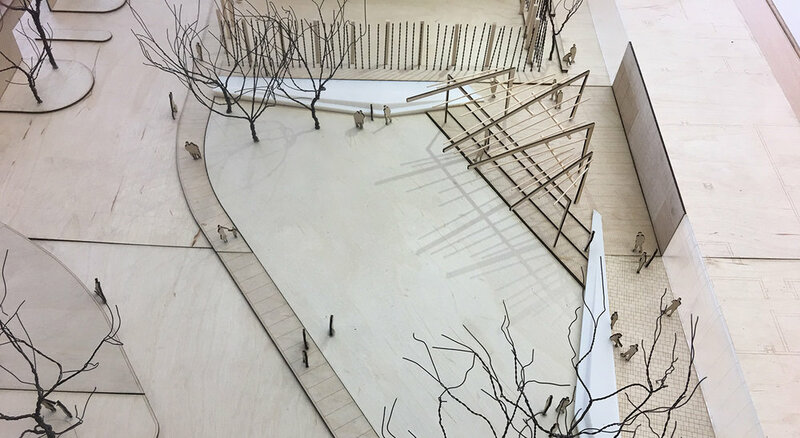 Wood benches and decks make direct reference to the boardwalk at the canal while, bicycle racks and lighting reference the surrounding urbanity. An integrated planting system parallels the street, referencing the historic Broad Canal and providing areas to absorb water runoff. 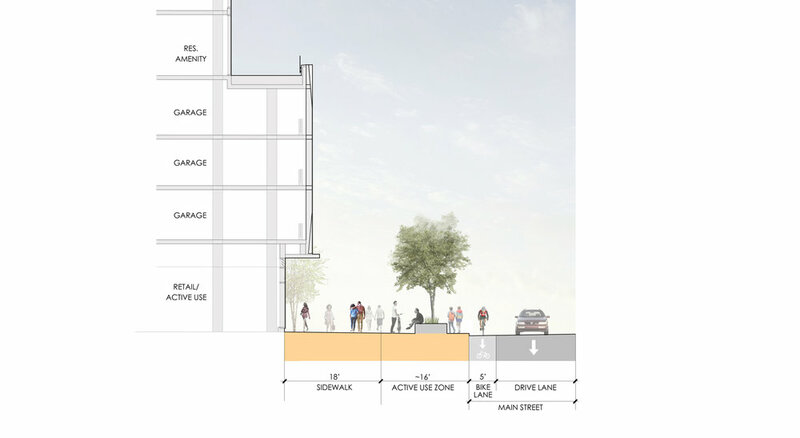 The land­scape integrates existing buildings and streets and their connections to the urban campus, weaving the open space into the city fabric, enhancing the existing urban network of East Cambridge.